Stop me if you’ve heard this one before. Tourists seeking an “authentic experience” go to a remote location where they discover that the natives are murderous. Or maybe this one: quite suddenly humanity faces danger from a previously harmless source. How about a woman is faced with the contamination of the child still in her womb. At its best, ¿Quién puede matar a un niño? is a genre-masher that draws together elements of eco-horror, colonialist terror of uncivilized areas, and generational fears into a fairly unique mixture. At its worst, it is a dull affair that largely consists of two people wandering around a small village while children grin. There’s a lot of footage dedicated to watching people walk around, not finding anybody. The premise is summarized by the lone surviving adult that our tourists (Tom and Evelyn, from England) find on the Spanish island of Almanzora. He reveals that two nights ago, at midnight, the children went into all of the houses and killed the adults. Nobody could stop them because “¿Quién puede matar a un niño?” (“Who can kill a child?”). It’s a concept that seems pleasantly naïve today. As the news shows us, plenty of people can kill children, and they do. The movie even tells the audience up front that children often suffer and are killed, as a narrator chronicles massive child casualties in conflicts of the mid 20th century. Germany, India and Pakistan, Korea, Vietnam, and Nigeria are discussed in order to hammer home the point: children are killed. Red rover, red rover, send an adult over! Here’s where we enter the realm of eco-horror. Just as the birds and the bees in other films, the children have had enough and spontaneously arisen in revolt against humanity — adult humanity anyway. Just as similarly, there is no cause provided for the sudden shift to aggression. It just happens. There is some evidence that the behavior is transmitted from child to child by proximity. In a chilling scene, the English couple find an isolate house on the far side of Almanzora. There are four children playing outside, but their mother and grandmother are fine and unafraid. Tom negotiates for a ride to the mainland once the men return from fishing, but he and Evelyn keep a nervous eye on the children. When two boys arrive from the village, the normal children run over to greet them. Much intense squinting follows, after which all of the children take on a predatory air. Perhaps the most unnerving thing about the film is that the children are not relentless until they’ve decided to kill again. They giggle and run and play. Of course the clothing the girls dress up in has blood stains, and the boys are excitedly removing the clothing from a dead woman, and they use a body as a piñata. Just like normal children. Evelyn and Tom have several interactions with the children of Almanzora that don’t involve stabbing or chasing. After all, to the children it’s a game, and what’s more fun than letting the prey believe it’s running loose? As long as they don’t get close to the exit. 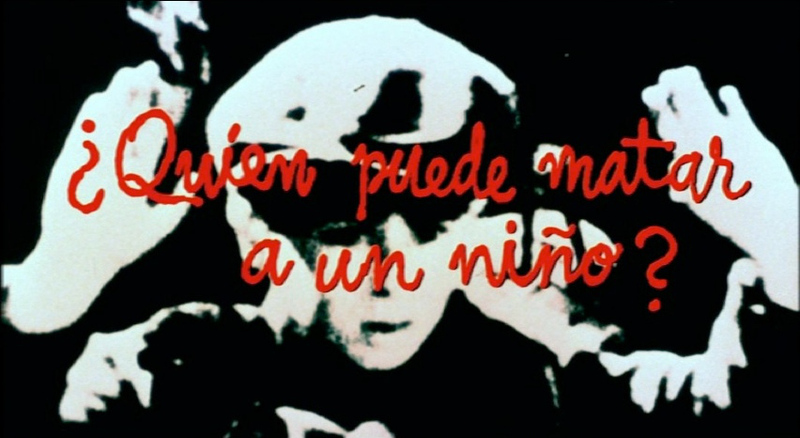 Tags: ¿Quién puede matar a un niño?, horror, HubrisWeen, HubrisWeen 2015, Juan José Plans, Lewis Fiander, micro-review, movie, Narciso Ibáñez Serrador, Prunella Ransome, review, Who Can Kill a Child?